Part of the Church Micro series -originally placed out by northking, this was adopted in July 2016. Suggested parking is directly outside the village church, so please take this into consideration when planning your visit. The public footpath runs through the small churchyard and out, over a stile into fields beyond. The cache is a short distance from the church. The cache is a 'Turtle' pot with GAGB sticker thereon. It is placed inside a cammo bag. Thanks firstly to Sadexploration for formalising the church micro series and to Roger Rabbit for placing some in this series locally. This was Northking's first church micro cache, and when he decided to retire from active Cache ownership we felt we should preserve it, so it's now our first Church Micro too; I hope that you enjoy it. Although it is slightly larger than a micro I believe that finding the cache will give you the opportunity of enjoying this quaint little church, and the hunt too. Muston is a village and a Parish in the district of Grantham and the County of Leicestershire. The village stands on the River Devon. It is close to the boundaries of Lincolnshire and Nottinghamshire. 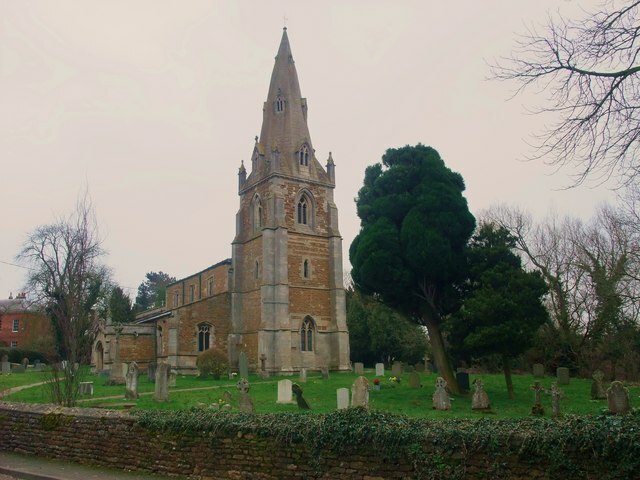 The church is dedicated to St John the Baptist and comprises of a combination of local ironstone and grey limestone brick work, with 13th century arcades, 14th century tower & broach spire and 15th century south aisle. The church is connected with the poet George Crabbe, in 1789 Crabbe lived in the rectory (at the side of the graveyard), prior to this he was Chaplain at Belvoir Castle, and a close friend of the Duke. Go look within, and ask if peace be there;. Nobir urnq urvtug va gur boivbhf cynpr.